- Over bowls of yak butter tea lighted by the glowing embers of an evening fire, Konchok Chap urgently asked a question: Where is the Dalai Lama? Smoke and ash swirled up through a tent flap into a night sky overwhelmed with stars. "Do you have any pictures of the Dalai Lama?" 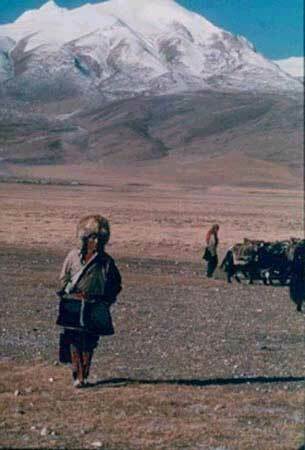 asked Chap, a herder of yaks. "Could you get one?" They are the questions that arise in the Chinese provinces along Tibet's eastern border, the area sometimes called Eastern Tibet, the territory that most of China's more than 5 million Tibetans consider home. The Dalai Lama, Tibetan Buddhism's spiritual leader, was born here - in China's Qinghai province, a part of Eastern Tibet - in territory that over the centuries fell under the control of the Mongols, the Tibetan government in Lhasa or warlords. China took firm hold of the region in the early 20th century, and to speak openly of the Dalai Lama today is to court the government's wrath. Last year, police arrested three monks at a monastery for distributing pictures of him. "All we want is to see the Dalai Lama before we die," Chap said. Whether Chap, 41, will get his wish lies at the heart of one of the most politically sensitive questions in China. The Dalai Lama, 66, has lived in Dharamsala, in northern India, since fleeing into exile in 1959 after the Tibetan uprising against Chinese rule. China, which claims it "peacefully liberated" Tibet, refuses to let him return. The Dalai Lama has pledged to seek only autonomy for Tibet, which operated as a defacto independent state from 1911 until the Chinese invasion in 1950. Chap and millions of other Tibetans are dedicated to the Dalai Lama because he symbolizes all that is Tibetan, from the snow-covered landscape known as the "Roof of the World," to the fortitude of its inhabitants. In addition to serving as Tibet's spiritual leader, he traditionally is the Tibetan head of state. Tibetans believe that the Dalai Lama, which means "Ocean of Wisdom," is the latest reincarnation of the Buddha of Compassion. Some simply refer to him as Kundun, "the Presence." His attempts to reach an accord with Beijing earned him the Nobel Peace Prize in 1989. For centuries, China exercised no more than nominal control over parts of Eastern Tibet. After coming to power in 1949, the Communists took over an area Tibetans call Amdo, which is a part of Gansu and Qinghai provinces. When the People's Liberation Army first arrived, relations were cordial. Later, troops imposed Mao Tse-tung's land reforms. The army tried to force Tibetan herders into communes and ordered them to surrender horses, pasturelands and money to the state. Many fled to the grasslands where they fought and lost to better-armed Chinese soldiers. More than four decades later, resistance is now mostly symbolic. The herders here are too scattered and too far from Tibet's exile government in India to muster an organized opposition. "In terms of a major revolt, it would be very difficult," Tsering Shakya, author of The Dragon in the Land of the Snows: A History of Modern Tibet since 1947, said in a phone interview from London. "There is no real great threat." Authorities are more lenient here than in Tibet, but they continue to jail people in Eastern Tibet for painting anti-Chinese slogans on walls and distributing tapes and writings of the Dalai Lama. Herders routinely display photos of the Dalai Lama in their tents. Draped in white or gold prayer scarves, the pictures sit in frames alongside photos of other Tibetan religious leaders or photos of the Dalai Lama's former home, the Potala Palace in Lhasa. There are usually seven metal bowls filled with water below the photographs. The bowls signify the first seven steps the Buddha took following birth. After each step, according to Buddhist faith, a lotus flower appeared. Distance from Chinese officials gives herders some latitude to worship as they wish. Many say they haven't seen Chinese in these mountains since the army came in the 1950s. Only when herders return to villages for winter do they slip the Dalai Lama's picture behind other photos or hide them in bags. Recently, Chap listened to a friend tell of a visit by the Dalai Lama to a nearby monastery in the mid-1950s before his flight to India. People waited days for a brief audience. Chaps eyes widened as the tale unfolded, the firelight dancing across the creases of his face. As he listened to the story, nothing seemed more important than soaking up every detail of the spiritual leader's visit. "Did you see the Dalai Lama?" Chap asked excitedly. When the visitor nodded, Chap's face filled with envy. "You are so lucky," he said.